A large data centre’s coolers have just been given valuable protection from contamination through the fitment of RABScreen air intake screens. The Hibernia Atlantic data centre is located on a one acre site on the north west coast at Southport in Lancashire. It’s a remote location surrounded by fields and the chiller cabinets would normally be subject to local airborne debris in the form of seed, pollen, leaves and insects. However, this quickly changed when adjacent land was sold off for housebuilding development. The two-year development project has massively increased the amount of airborne debris, not only from increased traffic but also the dust from construction. 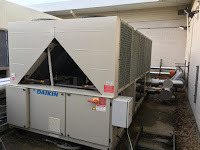 Paul Hanstock Air Conditioning Ltd which installed the chiller cabinets and which provides quarterly servicing recognised the potential contamination problem and has specified RABScreen air intake screens as the solution to the problem. RAB Specialist Engineers Ltd surveyed the RABScreen filter media up to 15ft in length to cover all sides of the three Daikin EWAQ520F-XL010 chiller cabinets. The screens were made with 32mm borders and easily fitted onto the cabinets using stainless steel grommets. Paul Hanstock, Managing Director of the air conditioning company has been delighted with the installation, commenting, “We are really happy with the way the installation went and the RABScreens will certainly protect the coils and keep them contamination-free. From this experience, we are very likely to use RABScreen on another site later in the year”. The RABScreens are likely to reduce the maintenance requirements by the air conditioning company every quarter and there should also be energy savings through the more efficient running of the air conditioning system. Just 1mm of dirt can reduce efficiency by 21%. Manufactured in the USA by Permatron, the RABScreen BHA air intake screen is a black engineered mesh, which is heavy duty and high abrasion resistant. Incoming debris held in place on the mesh is easily removed by vacuum, brush or washing during regular maintenance. Protecting the data centre’s equipment from incoming debris with RABScreen external screens saves money by extending the life of disposable filters and saves as much as 30% of input energy on chiller coils. This together with labour saved by reducing cleaning and chemical use, means that return on investment can be less than six months. RABScreen air intake screens are ideal for air moving equipment fitted in industry, in food processing factories, hospitals, hotels and retail, and in schools, colleges and universities. The RABScreen air intake screens are made of a black high abrasion (BHA) specification comprising a single layer of 9 x 9, 1000 denier multi polymer coated polyester mesh. Highly durable, rot and weather resistant, and UV protected, the air intake screens are UL classified for flammability and come with a ten-year UK warranty covering the media, grommets, final border and stitching. The media has ripstop corners that will not tear. There are numerous fixing methods to suit different situations and these include fittings with studs, bolts, self-tapping screws, magnetic strip, drop tab fittings, or by using a wrap-around technique with Permatron bungee cords.